The collect and readings for the Second Sunday of Advent may be found here. The appointed gospel is Matthew 3:1-12. Did you hear what John said? The wrath of God is coming. It doesn’t matter who our family is. The ax is out and ready. Right now the blade is against the tree. And the chopping is about to begin. Every tree that doesn’t produce good fruit is being cut down and burned. The unquenchable fire is raging, waiting to be fed the chaff. And that’s just the beginning. He said a greater one is coming, one more powerful than himself is on the way. After listening to John it’s tempting to look at the advent wreath, with its two lit candles, and see the season of Advent as merely the countdown to Christmas. Let’s leave this wild man behind. We know Christmas came last year. It will come again this year just like it has for almost 2000 years. It’s only a few more weeks away. 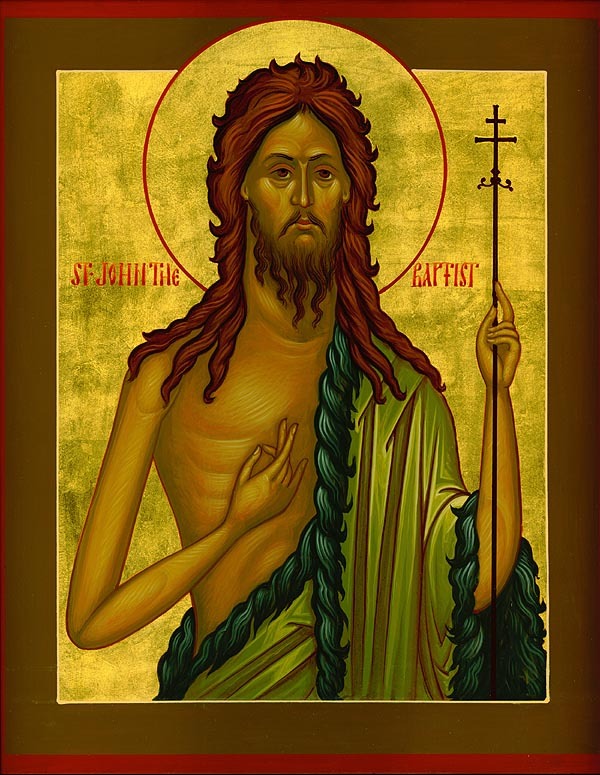 So maybe we can dismiss John’s message as allegory, metaphor, or symbolism. Maybe it’s the rambling of a guy who’s spent too much time by himself in the desert eating grasshoppers. Or perhaps we hear the message and think about all those other people to whom it applies. You know, the Pharisees and the Sadducees; someone other than us. But we can’t do that. The Church says this viper sermon of John’s is the gospel, the good news of our Lord Jesus Christ according to Matthew. For most of us, though, threats, anger, and judgment are not good news. We would rather hear and think about sweet baby Jesus. But John’s not preaching a Christmas sermon. John doesn’t mention a beautiful night with a bright shining star to guide us. There are no humble and gentle shepherds guarding their flocks by night. No wise men bearing gifts from afar. John’s not looking at a manger scene where the little Lord Jesus lays down his sweet head. He seems to have forgotten the innocent but faithful Virgin. And the name Jesus isn’t even mentioned in today’s gospel. This is Advent, the season when wrath, axes, and unquenchable fire are talked about as good news. John is looking for God to do something drastic right now. John’s message is, “Repent – turn or burn!” His refrain is, “Wrath, axes, and fire. Wrath, axes, and fire.” God’s coming and God’s going to get you. I suspect that part of our discomfort with John and his name-calling, his preaching of wrath, axes, and fire is, or at least should be, that at some level we know he’s right. When we look around our world, read the newspaper, watch the evening news, or examine our own lives we’re confronted with the reality of John’s sermon. Our world and our lives are not as they should be, as they can be, as God wills them to be. We could each name the sinful or broken places of our lives and world: anger, violence, greed, poverty, homelessness, war, lives controlled by fear, years of guilt that have crippled us. The list could go on and on. There’s only one sin worse than the evil itself and that is indifference to that evil. Indifference is more insidious than the evil itself; more universal, more contagious, and more dangerous. Often we live such busy, exhausted lives that we have become indifferent to what is happening in the world, indifferent to the needs of another human being. Maybe our world view, even our church view, is so small that if something does not directly affect our lives or those we love then it is of no consequence to us. Sometimes the pain and fear in our lives causes us to be indifferent to those relationships that need forgiveness and reconciliation. Maybe you have become indifferent to yourself and can no longer see the original beauty with which God created you. Perhaps indifference has convinced you that your life is meaningless. Indifference comes in many different forms. It is always sneaky, often disguising itself as freedom or independence. John’s cry of repentance is the call to turn away from our indifference to engage, at a life-changing level, the coming kingdom and the way that kingdom reorders our relationships and priorities. John’s words are words of interrogation. Do we care enough to change our lives and the world in which we live? Do we love enough to get angry about the suffering and plight of other human beings – even if we’ve never met them? God does. That’s why divine wrath, axes, and fire are good news. God loves enough to get angry. The good news is that our God is not indifferent. God is not indifferent to creation. God is not indifferent to the evil and suffering in this world. God is not indifferent to God’s people. God is not indifferent to your life or my life. God’s concern and love for creation are the source of God’s anger. Anger is not the opposite of love. Indifference is the opposite of love. The last thing we need is more indifference. The last thing we need is to hear from another that our very existence is meaningless. And God forbid that we should ever say or act as if another’s very existence is of no consequence to us. God’s anger is the rejection of indifference. God is paying attention and present in this world, in our lives. The anger of God is a form of God’s presence and love in this world. God’s anger is not offered as a punishment but as an encouragement to change, to turn our lives around. That can be frightening and even painful. But there is an agony even more excruciating. That is the agony of being forsaken, discarded, rejected, and abandoned. It is the agony of being the object of indifference. God’s anger is never the goal. The goal of divine anger is not punishment and retribution. Divine anger is the means, the instrument. The goal is love and relationship. Divine anger recognizes and celebrates the existence, the sacredness, and the value of every human life. Wrath, fire, and axes are God’s calling us to turn away from, to repent of, our indifference. Where does indifference rule our lives? How have we become indifferent to ourselves, to others, even to God? In what ways does indifference deny you the Kingdom of Heaven? Wrath, fire and axes are not about destruction or punishment. They are about life, love, and relationship. The unquenchable fire of God’s love burns away our indifference. The healing ax of God cuts away all indifference. The wrath of God reminds us that God cares and we matter. To name the places and ways of our indifference is the beginning of repentance and the Kingdom of Heaven has come just a bit nearer than it was before. Next Next post: The Church – An Atmosphere or Container?